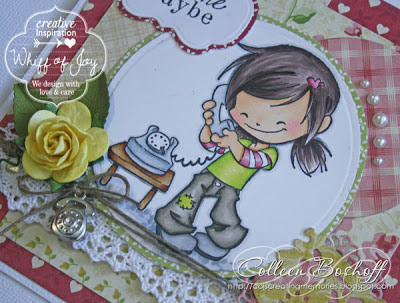 Col's Creating Memories: Whiff of Joy's Sneak Peeks! Hello everyone, Whiff of Joy's sneak peeks have started and you are in for a treat this month, such a gorgeous selection of stamps and Die-Lights! Oh and you can't forget the charms, oh so cute! 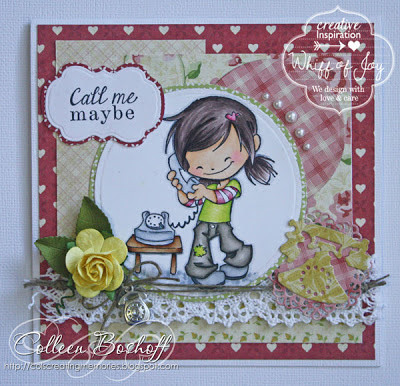 This cutie is Maya 'Call Me Maybe'. The sentiment is included, the phone Die-Light is 'Staying in Touch' and includes four dies, the twine is WOJ and so is the adorable little phone charm. The papers are Cosmo Cricket 'Tea for Two', Wild Orchid flower and the lace is from my stash. Don't forget to pop on over to my fellow DT and have a look at their sneak peeks and all these lovely new products will be available on the 11th June. Adorable image and super cute card with the phone die matching the theme!! Wat een leuke maar ook een prachtige kaart. Sweet image, thats a very ncie card creation, looks perfect!